Where you affected by the government shutdown? Even if you weren’t, there is an important lesson in it for all of us. We all heard about the toll it was taking on families who where affected. Unfortunately, most of the news was politically based. The truth is that many people were very unprepared for these missed pay checks, and the financial toll was real. The families received back-pay for their missed time, but that didn’t help with any accounts that may have gone delinquent during the time they weren’t getting paid. This is especially true for anyone who was behind on bills even before the shutdown occured. What concerns me is how unprepared most Americas are when it comes to missing a few pay checks. The reality is, life events can affect us at any given time. Wither it is medical bills, loss of job, death of primary wage earner, etc. As I thought about these life events, I realized there is an event coming that will impact all of us, and one we cannot avoid. What is it? The dreaded Recession. Just hearing the word brings back a lot of bad memories for those who were affected by the most recent one, which was the Great Recession. During the Great Recession there were devastating impacts on unemployment and income reduction. In December of 2007, the unemployment rate was 5%. 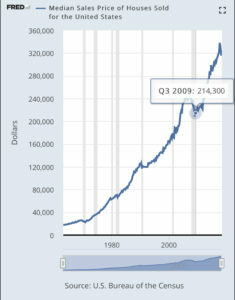 At the peak – what most economist considered the tail-end of the recession – it hit 10%. This is a rate we hadn’t seen since 1982. Here are a few interesting statistics that go over how unemployment impacted different demographics and geographies. For those who were lucky enough to keep their job, the highest wage earners saw an average of a 10% reduction in income, whereas low income earners saw closer to 25%. So where did people turn during this reduction in income? Their savings? 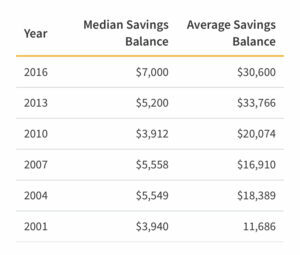 While savings account balances have been on the rise in recent years, the median household in the US has roughly $7,000 in savings. 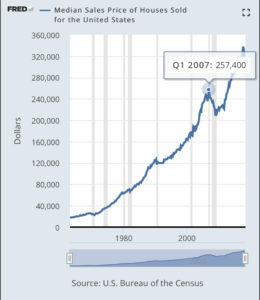 That number was even lower around 2008, at about $5,500. The median savings balance is more accurate to follow than the average because it takes out the ultra-wealthy households. For most families, this $7,000 in current savings, represents approximately 2 months of living expense – and for most families probably closer to 1 month. 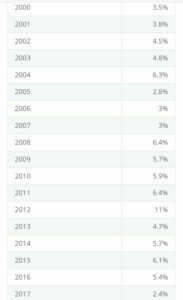 Over the last couple years, savings rates in the US have been dropping, with recent savings rates lower than the years preceding the Great Recession. And this helps us better understand the impact of the government shutdown. The purpose of this post is to discuss 5 financial tips to help families prepare for an imminent recession – as well as any other life event that may, and likely will come our way. The idea is that we cannot avoid some of these situations, but we can limit their impact by being prepared. For the sake of this post, these money tips are to help prepare for a recession, but can and should be applied to personal finance preparation in general. They represent sound financial principles for any situation. Coincidentally, it works well as sirens are commonly used as a warning signals in times of distress. I don’t mean to sound like a fear-monger, as I stated earlier, these steps really should be implemented for any individual that wants a stronger financial situation. The S in S.I.R.E.N stands for Savings. With the average American having roughly $7,000 in savings, in the event of a recession, most households would only have a month of money set aside to live on. You have probably heard that you should have closer to 6 months of savings in place – I generally agree – but I believe 3 moths is a more realistic goal for most households. An immediate first step in beefing up your savings is to do a spending review so you can identify a few areas of wasteful spending. Call this the low hanging fruit of your finances. There are things that you might be wasting money on monthly that can be eliminated quickly to start saving money. Their service is free, and definitely adequate, so I don’t see the need to pay for other tools that have a monthly fee. Once you set up an account, it is quite simple to import all of your bank and credit card activity so you can manage it in one place. It will interface directly with your accounts, so all you need to do to connect them is use your login for whatever institution you work with, and will do the rest. Once your activity is imported, you can then allocate your expenses into categories so you can quickly track your spending. This will help you be more effective with your Spending Reviews – AKA, your budget. Once you have done this, look areas of wasteful spending. Immediately cut back on these items, and start allocating that money towards your savings. I am not a fan of complexity, but if you are tempted to spend the money you are putting in savings, it would probably be a good idea to open a designated savings account in a separate bank. Having these funds separated can help eliminate the temptation of spending it. If you decide to create this separate account, DO NOT request a debit card. This will make it harder to spend this money. Focus on getting to the 3 months of savings as quickly as possible, then move your goal to 6 months. The I in S.I.R.E.N stands for Income. Because income is an easy target for employers, this is one of the first areas they look to cut during a recession. For this reason, you should evaluate your income to see what a 10-20% reduction would do to your finances. Because you are already cutting expenses with your savings, once that habit is in place, you will have already accounted for this reduction in income. The quickest way to give yourself a pay raise is to lower your expenses, so getting lien on your living is an easy way to absorb reductions in income. Try this for a month and see what kind of impact this would have on you financially. This will help you determine how much work you have to do to prepare for a potential reduction. Hopefully your income isn’t affected, but many employers may take this step to help preserve jobs – less pay is better than no pay, right? When the stock market is going up or down, your retirement accounts will require rebalancing. When you set up your retirement accounts, you can elect how much money you want to go towards stocks and bonds, this is called your investment election. Each year the market moves up or down, which affects these investment elections. 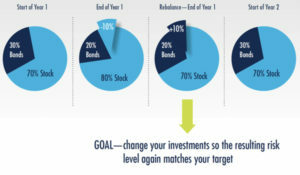 As an example, if you are 35 years old you may (not investment advice, just an example) have 80% in stocks and 20% in bonds. This represents a more aggressive approach, whereas if you are close to retiring you may be in 20% stock and 80% bonds – the opposite of the 35-year-old. When this 35-year-old has their investments set up on this 80/20 stock-to-bond allocation, after a year or two of market movement, their election will no longer be 80/20. Let’s say the three years after setting up their account the market goes up 30%. They would be out of balance from their original designation of 80% stocks and 20% bonds. They may be holding 85% in stock and 15% in bonds. For this reason, your retirement accounts should be reviewed frequently to make sure you are balanced according to the appropriate risk you want to take. This is especially true when it comes to the tail-end of a strong stock market – which we have seen for the last 8 years. You have likely seen large gains in your stock positions, which is making you more heavily weighed in stock than bonds. Here is a detailed explanation on rebalancing from Fidelity.com. Now is a good time to check those allocations and make sure you are invested correctly. You do not want to go into a market correction being too heavily weighted in stocks. If you have questions about this, make sure you ask a licensed professional. Most 401(k) providers have investment representatives available to help you at no cost. When you are rebalancing, it is also a good time to review what funds you are in, and what fees you are being charged. There are many low-cost index fund options available in most retirement accounts. The E in S.I.R.E.N stands for Employment. The more valuable you are to your employer, the more likely you are to stay employed. That seems pretty straight forward, yet how many of us are currently in an employment situation that are not secure? It is a good idea to review your career frequently to make sure you are on track, and that it will help you reach your long-term goals. Here are a few criteria through which I like to evaluate job security. Are you inspired by what you do, or are you just biding your time with a 9-5 job you don’t like? Does your job provide the income you need to support your family, or are you struggling to get by? 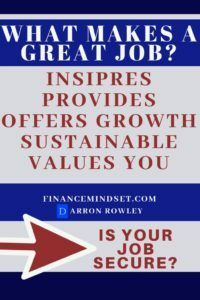 Does your job provide income growth and job expansion? Is your job sustainable, or will it become obsolete in the coming years because of technology, or something else? Are you a valuable asset in the company, or can your job be done by anybody? Some of these questions may concerning, but must be evaluated. If your job will not provide income growth, it may be beneficial for you to start exploring options. If you are going to become obsolete, start improving your skills and knowledge so you are better protected long-term. If you dislike what you do, make a change. It is likely affecting more than just your income. Whatever the current status of your job is, take the time to evaluate where you are, and what your plans are for the future. Income growth an often-neglected part of personal finance, so make it a priority. The N in S.I.R.E.N stands for No Debt. We hit on this briefly in the savings section. A reduction in expenses – including debt – is akin to a pay raise. When hard times hit, having no debt is going to put you in the strongest possible position to weather the storm. 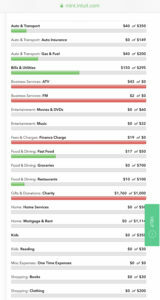 The reason getting out of debt is so important is because expenses can be cut quickly, but debt takes time to pay off. We saw this reality in 2008, especially with housing. When home values started to drop, and incomes went with it; individuals quickly realized they were house poor. This caused a lack of accountability, because when many households saw they were underwater on their home, many walked away. While it is not reasonable for most individuals to pay off their home, it is important to evaluate your housing expense to make sure it is inline. Preferably, your housing should be less than 20-25% of your take-home-pay. If not, you may be in a house-poor situation. As for other debts, ie…cars, credit cards, student loans, etc., your priority should be to get these debts paid off as quickly as possible. If you can get rid of an auto loan by downgrading it, I would strongly encourage you to do so. That money can then be used to bolster your savings. Even if you drop your payment in half by downgrading, that is a big win. You may also be able to refinance your debts to better manage the monthly payment. Be creative with your approach. If you first eliminate the obvious spending, you can then use it to pay off these debts or put towards savings. Your debt will likely be your #1 enemy once the next recession hits. The sooner you can get out from underneath these debts, the better off you will be. These 5 steps are simple but impactful ideas to help you evaluate your current financial situation. You may find they all work for you, or just a few. Either way, knowing what challenges will be faced during the next recession is a key component for your preparation. The more prepared you are for it, the less of an impact you will feel. This was definitely apparent during the Great Recession. 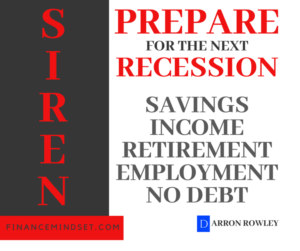 I was working in the financial field as a mortgage loan officer during that time, and form my experience, when 1-2 of the SIREN money tips were not in order when that recession hit, the harder it was for households to survive financially. With us being in the longest bull market run we have ever seen, it is a matter of when the next recession hits, not if it will hit. This isn’t a reason to act out of fear, but rather a SIREN call for those who may not be ready financially. 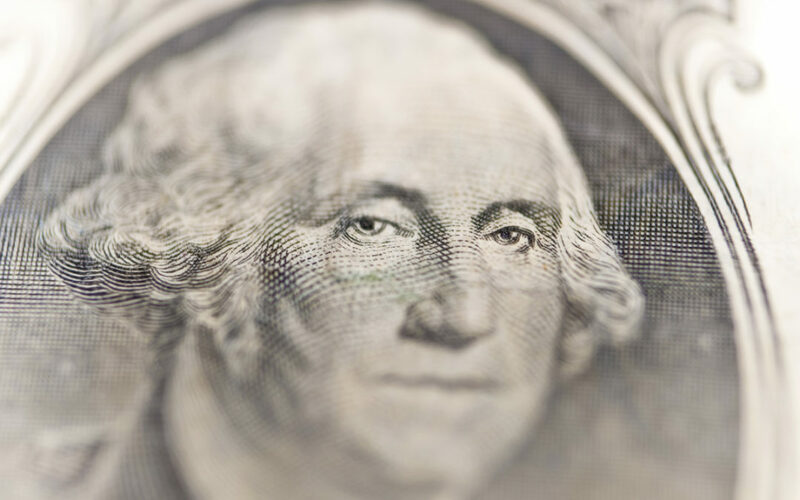 Takes these 5 money steps to help prepare yourself for the financial unknowns in life.